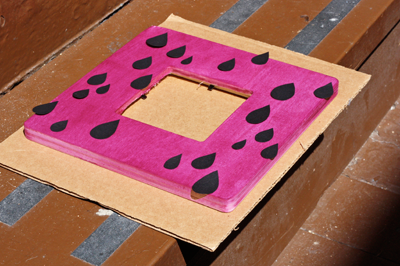 Inkodye testing continues in the Jones lab, this time on wood. I bought an unfinished frame at Michaels for one whole dollar and doctored it up with the dye. This is the result. Who are those youngsters in the frame? Beats me. Is anyone friends with them? I needed a temporary photo to stick inside so I could take a picture of the finished product. I searched online for "couple with umbrella," found this product photo, and printed it out. At one time Alex and I owned a double umbrella. It was an impulse purchase when we were caught in a rainstorm. I think we used it twice. I wonder whatever happened to it. But back to the project. 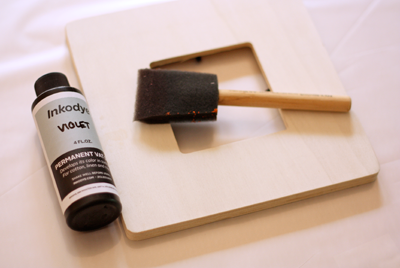 I brushed Inkodye onto the frame with a foam brush. It doesn't take much for wood, so this won't use up much of your precious elixir. 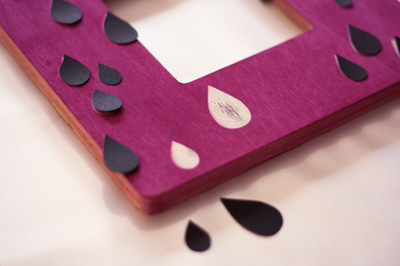 I cut raindrops out of black paper, arranged them on the frame, and carried the ensemble out to our back stairs. After 5 minutes, the color seemed bright, so I brought it in. The photo above is probably around the 2-minute mark. Since the frame was damp from the dye, you'll notice the paper curled just a bit, and some of the black ink from the paper was transferred to the frame. I managed to scrub it off pretty thoroughly, fortunately. Maybe next time I would cut up some vinyl, or contact paper with the backing left on, or something opaque and unaffected by moisture. I quickly washed the frame with soap, water and a sponge, rinsing and scrubbing to get all the excess dye off, particularly from the raindrop areas. 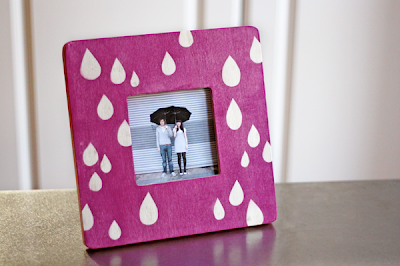 Do this promptly so the dye won't continue to develop in the raindrops! The result looks pretty good. Other Inkodye projects are here and here. I have been thinking that there are a number of surfaces other than fabric I want to try the Indodye on but didn't really know what I could do to stop the reaction. Keep up the good work! I am following along! Lovely frame. I *really* want to try some of this dye! Ha, typical mom comment up there. Wait till you see the next project. It's not as good. So it will be a test for you, Mum. If you say it's great, I'll know it's because you're my mom and not an objective reader. Okay, I'll prepare a negative comment, just in case. Wow...amazing! Would never guessed that was a DIY project!! You always have the best ideas! Love them! Oh my goodness, this is really creative. Didn't know that it can be done on wooden frame. I am ordering mine soon. Keep up the good work! Lovely frame. I wonder if it would work to simply colour on the frame with a stick of clear wax? Much like is done with easter eggs? I think so-it would resist the dye in those areas. As long as you don't mind wax that stays on your picture frame, right? I'm so intrigued by this product-- thanks for doing all the testing. I'm wondering... since you mentioned the contact paper or vinyl, does this give a different effect than say, putting contact paper patterns on and painting the frame? Does it look more like stain? Can't wait to do some experiments of my own. This stuff does look more like stain, since you can see some of the woodgrain through it. Think dye, not paint. I've wondered about applying contact paper stencils first and then brushing the dye over them. As long as they'd stay stuck down, that is. If some dye bled underneath, I wonder if you might see it since even unexposed, it has a very, very slight tint. Hmm. Things to ponder! Oh, I think I really, really need this. Where is my credit card *looking around*? I'm so excited to try this product out. After reading your post yesterday I went and ordered some. Yeah! Thanks for all of your great ideas, I love reading your blog! Ok, now I really want to try this dye! How did you come by a sample? That's so cute! Thanks for trying it on wood. I'll probably have to get some soon. After your post yesterday, I spend about 30 min on Inkodye's website looking at their projects. It looks like fun. Super cute! This stuff looks awesome!! I applied it with the foam brush too but mine came out so streaky =/ Has yours ever turned out like that? Yours looks so even. Thanks so much! Weija, were you applying the dye to wood? It might have something to do with how hard or soft the wood is, and what the grain is like. This is the only wood project I've tried; the rest have been fabric. This dye looks like a lot of fun! I can already imagine so much projects to do with it! Thank you for sharing!